How to Get Your Perfect Body Shape at Your Home? 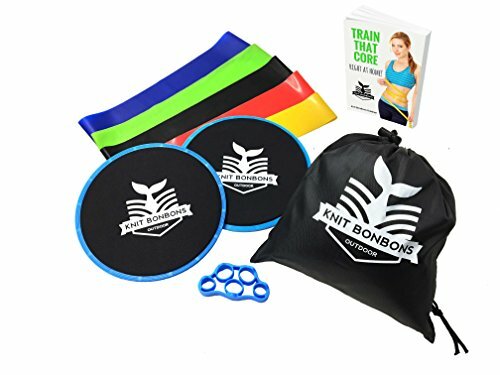 Knit BonsBons Outdoor provides a unique home fitness kit, comprising of 2 gliding sliders and 5 different range of resistance bands with a finger stretcher for body shaping in a flash. So, this unique kit is ready to use for Sports, Fitness, Weight loss and Body Shaping. How KBB Outdoor fitness kit benefit to you? It is designed with flexible holes to avoid band from slipping off your fingers. What are in the package? Take a glance here! KBB Outdoor always got you back, please do not hesitate to contact us! PERFECT FOR BODY SHAPING - Everyone deserves to be healthy and look great. KBB Outdoor fitness set of sliding discs, resistance loop bands and finger resistance band facilitate you to target all muscles groups, from your abs to glutes and legs. Let them get your desired body today! VARIETY, SAFE & EFFECTIVE - KBB Outdoor gliding disc core sliders and resistance bands are the perfect kit of equipment to define your own workout! You can choose appropriate resistance level from our multiple color bands, while exercise discs ensure your hands and feet never leave the floor, featuring a low impact but highly effective workout. CONVENIENT TO USE - KBB Outdoor always make things easier, including fitness. Whenever you need to get workout, our light yet compact exercise discs and resistance bands allow you to take them wherever you go. Bringing our carry bag, you'll use all of them for stretching, power weight program or general exercise anytime and anywhere! EXCLUSIVE OFFER - FREE finger stretcher is included in KBB Outdoor fitness set. When you text, drive, type or any activities required to use your gripping muscles, our finger strengthener is one of the best trainers for you. Now, we offer it as a free gift when you purchase our fitness set. Get it while it's hot! PURCHASE WITH CONFIDENCE - We stand by the quality of our products while we always got your back, and if there is an issue with your product, just contact us for a full refund. So, why don't you give them a try? If you have any questions about this product by Knit BonBons Outdoor, contact us by completing and submitting the form below. If you are looking for a specif part number, please include it with your message.